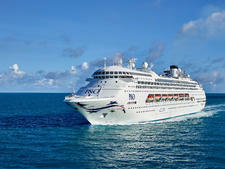 Transformed in mid-2017 from its former life as Dawn Princess, the 77,000-tonne Pacific Explorer is P&O Cruises' biggest ship in Australia. Two decks higher and 40 metres longer than Pacific Eden and Pacific Aria, it's closer in size to Brisbane's Pacific Dawn but Explorer takes an extra 450 passengers. Almost everything is new, thanks to the refurbishment, and some features have only just been introduced to P&O this year, such as dual waterslides, a lawn bowls green and the Walk the Plank experience. Unlike the rest of the fleet, Pacific Explorer has two adults-only areas, both with plunge pools: Oasis, as found on all P&O ships, and The Sanctuary, left over from its Princess days. There are two main pools, too, largely commandeered by kids. New drinking holes include The Bonded Store, a speakeasy-style den of cocktails, and the lovely Explorer Hotel, where karaoke, trivia and other games attract a full house. A P&O passenger favourite, The Dome nightclub is missing; late-night revellers are instead directed to the Blue Room, where you'll discover how many young Australians are cruising these days. There are also more places to eat. The Pantry food court has added a ninth free outlet, Nic & Toni's (Italian), while the other new eateries cost extra (and are worth it). Shell & Bones serves seafood supplied fresh for each sailing from Sydney's fish markets, and 400 Gradi specialises in delicious pizzas. For Luke Mangan admirers, Salt Grill has been replaced by the chef's poolside burger bar, simply called Luke's, as well as A Taste of Salt degustation held at the Chef's Table. Angelo's and Dragon Lady are back, and some passengers didn't realise these restaurants are free; don't miss out. In some areas, Explorer is lacking. With only two options for a free breakfast or lunch, The Pantry is chaotic and its seating inadequate (try the Waterfront instead). On sunny days, it can also be hard to find a spot on the pool deck. Fewer than half of the 999 cabins have balconies, which isn't ideal for the tropical South Pacific. At least it means there's a lot of cheaper accommodation. Regrettably, there wasn't time to refurbish the cabins during the 12-day dry dock so their dated decor is in stark comparison to the modern public spaces. Blocked toilets and foul smells used to be a problem; however, a lot of effort has been put into maintenance and there are regular reminders for people to respect the delicate plumbing system. Another type of bad smell occasionally wafted through near the storage tanks below the passenger decks -- an unfortunate design of this class of ship. Again, P&O has since adjusted the vents to minimise any odours coming into the ship and this issue appears to have been resolved. 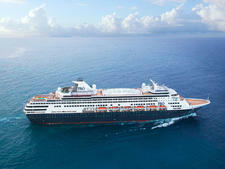 We prefer to focus on the crew's friendly service and all the fun we had on our 10-night cruise. 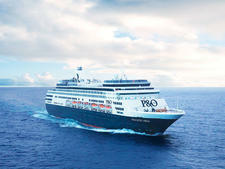 A wide variety of activities are held onboard and the entertainment is great. The standout is Love Riot, arguably the best and bawdiest show at sea, at the new Black Circus cabaret lounge. (Read our review before buying tickets -- yes, it costs $10 -- as this burlesque circus is rated 18+ for good reason.) Also keep an eye on the daily program for the Blues@Blue night, a one-hour jam with superbly talented musicians and singers. 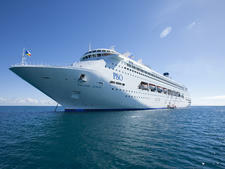 Pacific Explorer will appeal to both P&O and Princess fans as it's a pleasant mix of these two styles. First-timers should also not hesitate to try it, with no shortage of things to do in an attractive, comfortable setting. Almost every passenger is Australian. Families are the core market but expect to meet a lot of couples and groups of friends, as young as 18 years old through to retirees. 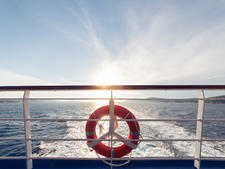 Many are first-time cruisers, while other people have previously sailed with P&O. Daytime is casual, evenings are smart casual. Instead of formal nights, Pacific Explorer has theme parties. The three themes, depending on the length of your cruise, are Bianco (white clothing), Gatsby (1920s glamour) and Back to School. Dressing up on party nights is optional. There is no compulsory tipping on Pacific Explorer. No gratuities are added to passenger accounts but you can choose to tip crew for excellent service. Envelopes are provided at the guest relations desk in the atrium.